Champakali is an awesome snack item and I was really surprised when I first read about it as the name was really new and unique for me. 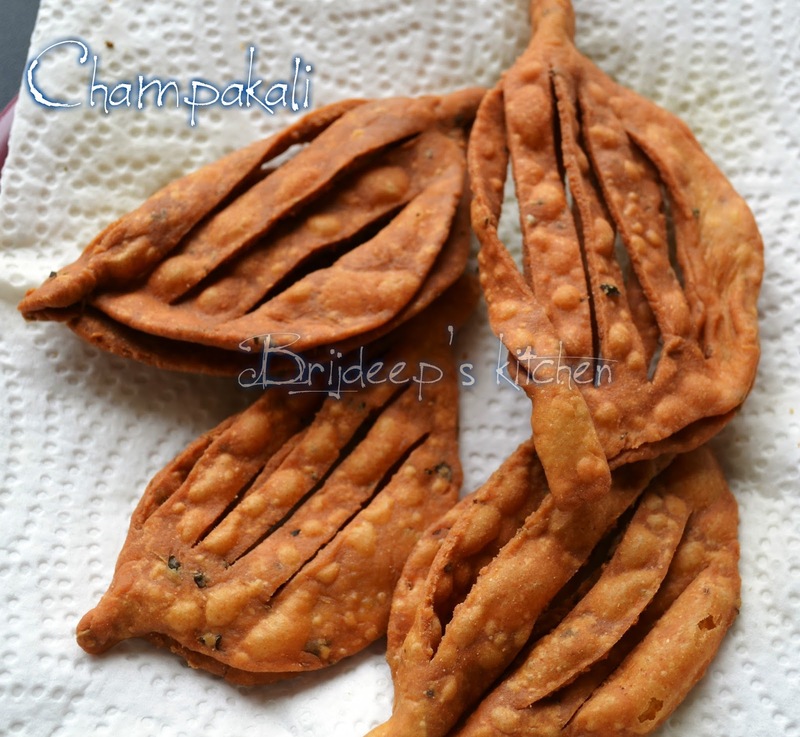 This is also called as namkeen karela. 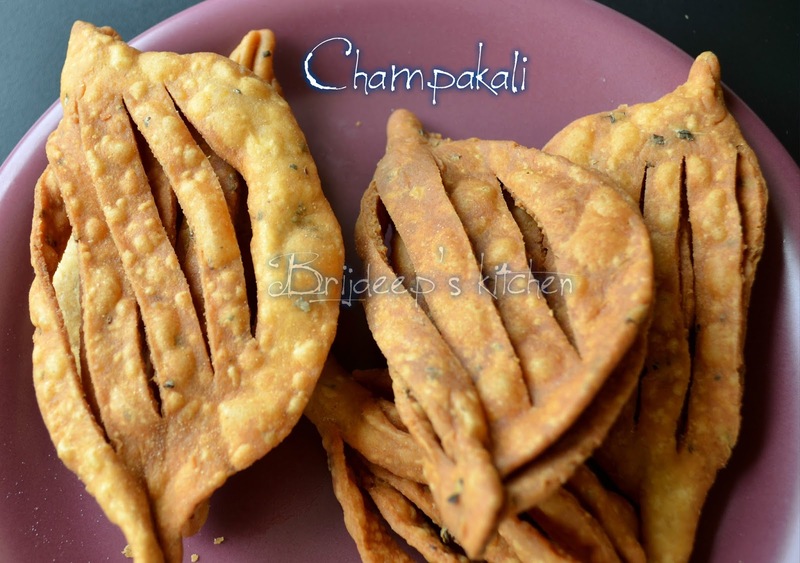 So what exactly is Champakali? 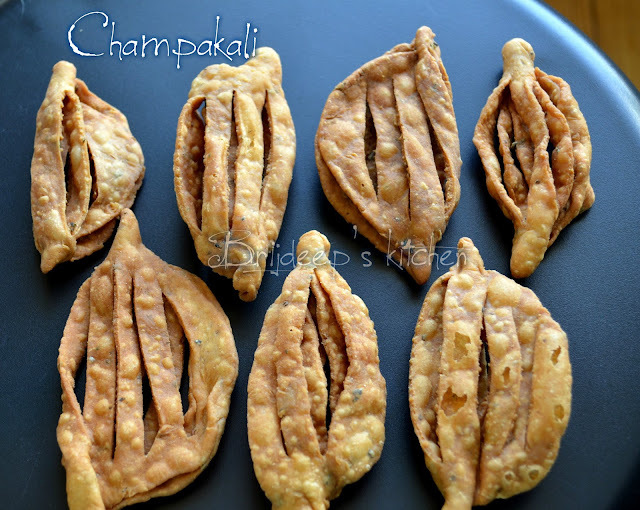 That's what I wondered when I first saw an image of Champakali. 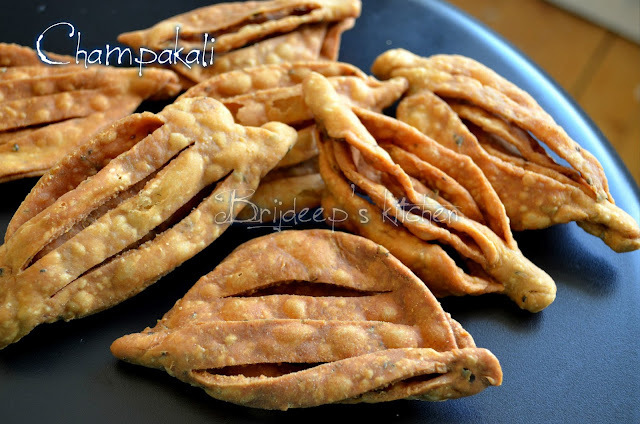 It's basically an Indian tea-time snack because we simply need tea-time snacks, isn't it? The recipe I got inspired from used all purpose flour. 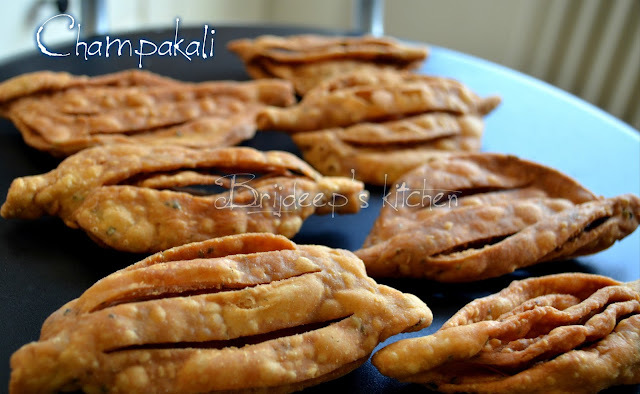 But because I had already experimented a lot with whole wheat, like Whole Wheat Samosa, Wheat Kachori, Wheat Papdi, Wheat Namak Pare etc, I wanted to experiment the same with this dish, and I decided to go with whole wheat, the healthier version. Wheat is no doubt healthier, but it reduces the shelf-life. While I am pretty sure these aren't going to last for long, I went for the wheat ones. You can use half-half wheat and all-purpose flour for increased shelf-life. Also, this can be made completely from all purpose flour. More the all purpose flour, more the shelf-life. 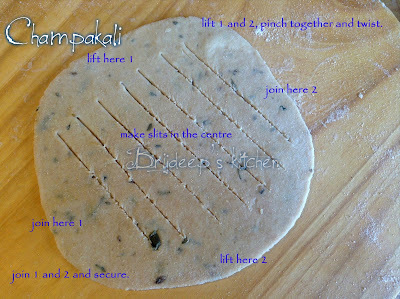 Keep in mind the amount of water required to make the dough will vary with all purpose flour, it would be lesser, while it takes a bit more water with the wheat flour. Otherwise, this also can be stored for up to 2 weeks (if it doesn't finish up pretty earlier than that). It was a superb experiment, and turned out beautiful nonetheless. Tasty and savory, pretty sure they would be finished up before the week ends. 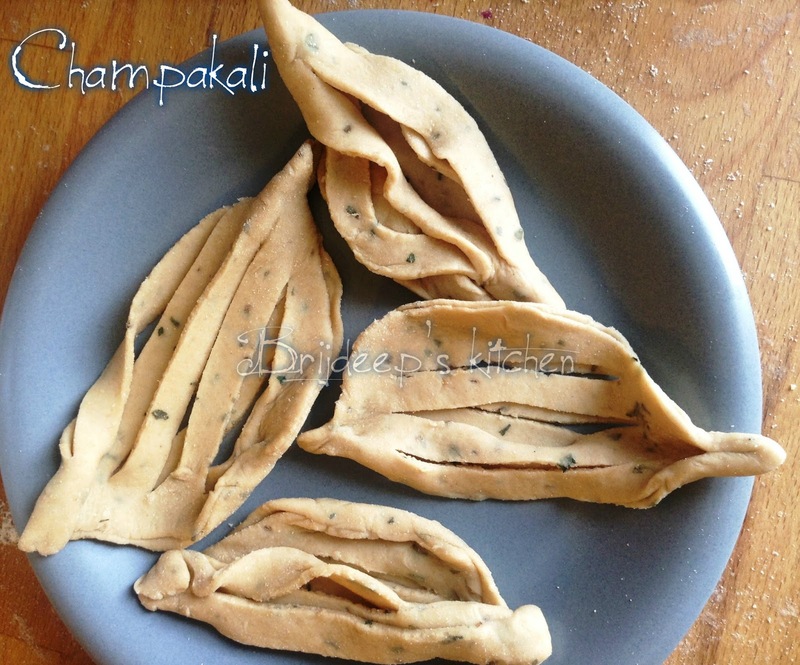 Oil or ghee to add in the flour: 4 tsp. Mix salt and carom seeds into the flour and mix well. 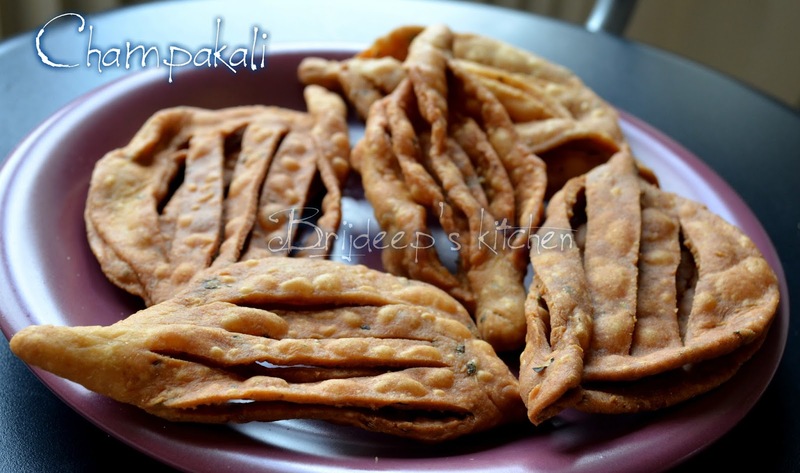 Add the melted butter or ghee to the flour and mix well with fingers till it is of crumbling consistency. Add little warm water to the flour and mix. Add water, very little at a time to gather all the flour together in a ball and make a hard dough. Cover with a muslin cloth and keep aside for 20 minutes. Pinch little balls from the flour and flatten it with a rolling pin. With the help of a sharp knife, create vertical slits in the center, do not cut the edges. Lift it up after making the slits and seal both side edges with your fingers. Twist a bit from the top and bottom and pinch the edges as shown in the picture. Add it to the oil and fry on medium heat until it becomes golden- brown from both sides. Take out and drain on a kitchen paper to absorb excess oil. Repeat for all the dough. Store in air-tight container for up to 2-3 weeks. Have you tried this awesome recipe yet? Do share your views/feedback in the comments section below. 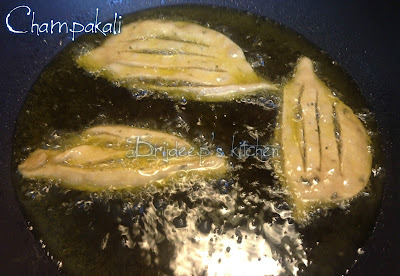 Also, don't forget to connect with me on Facebook: Brijdeep's Kitchen for regular yummy updates.